Hosted by: Columbia University’s Sustainable Development Doctoral Society. Dates/Location: April 25th – 26th, 2014; Columbia University, New York City. Keynote Address by Professor Jeffrey D. Sachs. Deadline for presenters to apply: 31st of January, 2014. The sustainability of development presents some of the most important policy challenges concerning the future of our planet. None of these central issues can be understood from the sole perspective of a traditional discipline, whether in the social, natural, engineering or health sciences. After the great success of the inaugural workshop in 2011, Columbia University’s Sustainable Development Doctoral Society is convening the fourth annual Interdisciplinary Ph.D. Workshop in Sustainable Development (IPWSD); scheduled for April 25th – 26th, 2014, at Columbia University in New York City. The IPWSD is a workshop open to students working on or interested in issues relating to sustainable development. It is intended to provide a forum to present and discuss research in an informal setting, as well as to meet and interact with similar researchers from other institutions. In particular, we hope to facilitate a network among students pursuing in-depth research in one or several disciplines, whether quantitative or qualitative in focus, to generate a larger interdisciplinary discussion concerning sustainable development. Workshop attendees can present current research they are working on, serve as discussants, or attend the workshop without presenting or serving as a discussant. and Institutions, Path Dependence, and Global Governance. The intention is to assemble a group of researchers across a range of disciplines in the social and natural sciences, whose research contributes to a deeper understanding of the interactions between natural and social systems within their particular field(s), but who are capable of discussing this work with a broader audience of peers. It is anticipated that disciplines represented at the workshop will include: economics, earth and environmental sciences, political science, engineering, ecology, epidemiology, geography, law, and others. If your research pertains to the field of sustainable development and the linkages between natural and social systems, we encourage you to apply regardless of disciplinary background. The workshop will also feature a keynote address by Prof. Jeffrey Sachs, Director of The Earth Institute, Columbia University. If you are interested in participating, please complete our online Registration Form . Participants may present a paper, serve as a discussant, or both. We also encourage you to register if you simply wish to attend the workshop without presenting or serving as a discussant. If you would like to apply to present your work, please include with your registration a long abstract, ideally reporting preliminary results (full draft papers are also welcome). Long abstracts should be emailed to cu.sdds.ipwsd@gmail.com. Applications to present are due by the 31st of January, 2014. All applicants will be notified of the final decision regarding their submission by mid-February, 2014. Students in the dissertation stage of their Ph.D. will be given priority for presentation slots, though non-Ph.D. students (e.g. post-docs) are also welcome to apply. We will try to provide an opportunity to present for as many applicants as possible. Workshop participants are expected to cover their travel and lodging expenses, but there is no fee for participating in the event and light breakfast & lunches will be provided. Additional details, including instructions for presenters/discussants, related events, a social program, options for accommodation, NYC transit directions, and other information can be found via the links at the bottom of this page. These links will be updated frequently, so please check back often! If you have any questions, please do not hesitate to contact the planning committee at cu.sdds.ipwsd@gmail.com. We look forward to seeing you in New York this spring! The Fourth IPWSD Planning Committee. 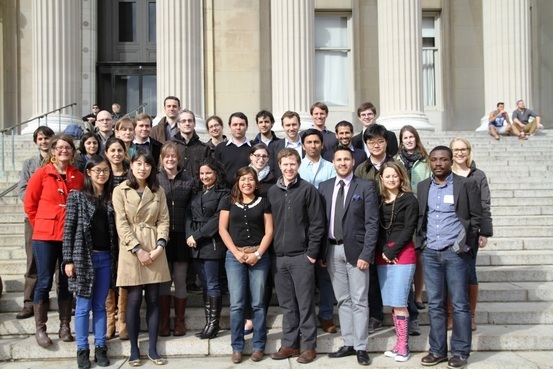 The Sustainable Development Doctoral Society is the official organization of the students in the Ph.D. Program in Sustainable Development at Columbia University. We would like to sincerely thank our sponsors for this event: the Sustainable Development Solutions Network and the Earth Institute at Columbia University.